Refirme is an advanced non-surgical skin tightening treatment, with minimal discomfort and no down-time. 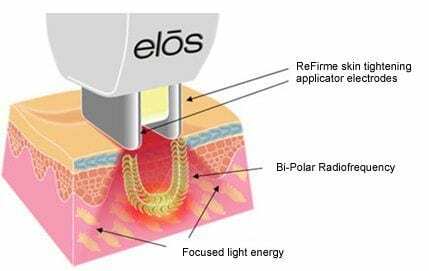 The treatment uses Elos radio frequency technology to gently stimulate the body’s natural production of collagen. Collagen is the substance that gives your skin the natural tightness and elasticity. As we age the collagen content in our skin reduces and this is one of the reasons we get lines and wrinkles as we grow older. The Refirme Treatment naturally stimulates the body’s natural production of collagen, and as the levels of collagen increase in the skin, you will notice a gradual contraction of the skin. We recommend for lasting results that you have a course of six treatments at intervals of one every four weeks and one maintenance treatment every six months. The treatment will be carried out in one of our treatment rooms. The procedure takes between 30 and 75 minutes. You will experience a sensation like being flicked with tiny elastic bands. And following your treatment you just get on with your life! We Guarantee you’ll see instant results! Some clients experience a little redness and puffiness in the skin that is normal but goes away in a few hours. However, most clients don’t experience any after effects. The Aesthetician will take you through the process before your treatment and discuss with you any concerns you may have.